The nine songs where recorded and mixed at the studio Jardin, Hainaut Occidental. The cover image was elaborated by Serge & Saya in ink on cardboard. Inside photography is from Charlotte Bonjour. The cover’s design and typography was arranged by Arison and Pierre Spec. The record is produced by Pierre Normal and pneu. Pneu likes to thank Ramun Vital for his donation. French lyrics are printed in the 8 page booklet. Pierre Normal is much about seeking. Most of all by seeking a way not to stay silent under the pressure exercised by the surrounding capitalist suicide. A seek to perhaps be able again to sing and play, words and music, as what they can be ; magic to spin bridges between the unconnected. The soil is mined, the confusion great but there is no choice, raging and crying in silence is losing our lives to what must become a unconscious enemy ; a system. It uses words only to complete its functionality and needs music only to trick out mistrust by appealing to our sentiments. We want to laugh and dance but sometimes can only cry and destroy. The nine songs are about letting ourselves fall in the unknown and frightening, a sleeping agent’s unending waiting, a materialistic look on the biographies of contemporary products, a nightmare, mental withdrawal in a world without relief, the meeting and losing of a friend, a walk through a reliving landscape, the memory of a friend at a carnivals afternoon, a wondrous tale behind the mountains and a attempt to make us lose fright of death in a world full of potential dangers. could be filled under electric/now/no-wave, square-wave chanson, gates to the crackly garden.
" Ã€ Ã©couter fort. PremiÃ¨re impression, culture sonore Ã©lectronique un peu braque percutant le genre Â« chanson franÃ§aise Â », avec des embardÃ©es de vibrations brutes de voiture tunÃ©e. Puis petite chanson futÃ©e, flÃ »tÃ©e qui glisse dans la techno une petite Ã¢me fragile, blafarde quÃªte de Â« corps avec quelquâ€™un dedans, limpiditÃ© intangible, on nâ€™est plus seul Â ». Jâ€™avais dâ€™abord entendu Â« Usure intÃ©grÃ©e Â ». Comme un mot-valise qualifiant une certaine fatigue robotique de nos circuits cÃ©rÃ©braux et Ã©motifs. Morceau un peu dur, penchant du cÃ´tÃ© de Programme. Et alors, content de voir surgir cette inspiration par chez nous (Belgique/Hainaut). Texte presque post-marxiste thÃ©orisant la dÃ©sincarnation comme cÅ“ur de la production, la lutte des classes au pays des ordinateurs. Un tout petit quelque chose, alors, ravive le souvenir de la premiÃ¨re Ã©coute du premier Dominique A. (La Fossette). Claque mÃ©morable. Mais je sens quâ€™ici, ce sera plus court, quand mÃªme. Il nâ€™y a pas la mÃªme homogÃ©nÃ©itÃ© radicale, pas la mÃªme dÃ©termination Ã la diffÃ©rence. Certaines chansons sont carrÃ©ment plus hybrides au niveau des influences, je me surprends mÃªme parfois Ã penser Ã un mÃ©lange de Brigitte Fontaine et du Sttellla des dÃ©buts, quand lâ€™humour loufoque Ã©tait parfois limite tragique, proche de la dÃ©tresseâ€¦ A cÃ´tÃ© de textes constatant un Ã©tat des lieux machinal, alarmant, dâ€™autres sont portÃ©s par des souvenirs plus ruraux, dÃ©coupage surrÃ©aliste dans des ambiances de village, avec des histoires lÃ©gÃ¨rement Ã©tranges, anecdotes campagnardes un peu sombres, dÃ©calÃ©es Â« Novembre Tardif Â », Â« Carnaval avec Xavier Â », Â« Quel Talent Â ». De belles petites mÃ©lodies hagardes pour chanter contre le vent glacial des machines, en emportant des images grises de feuillages agitÃ©es, vÃ©gÃ©tation de lithium dans lâ€™orageâ€¦ â€ Allez faire des rondes Ã lâ€™aÃ©roport envoyez des signaux lettres mortesâ€¦ charisme de plante de bureauâ€ . "Our curiosity was aroused a few months ago when we heard about a new project called PIERRE NORMAL, featuring D. TREP from HVAL MUS, to be released on the unconventional Belgian label Pneu. Their first CD has finally arrived and it meets all our expectations, delivering nine electro anthems which are the perfect symbiosis between New French Chanson and dark electronics as we know them from HVAL MUS. RACHEL SASSI’s voice carries with impeccable nonchalance bitterly sparkling lyrics whose darkness and playfulness echo those of D. TREP’s and P. JUPITER’s electronics. Includes a great French-electro cover version of NIRVANA’s "Lithium" - which by the way gives you a pretty fair idea of the overall mood of the album. Bitter honey to our ears for summer nights on the edge of the abyss." "Simply fantastic new project around one member of Hval Mus. 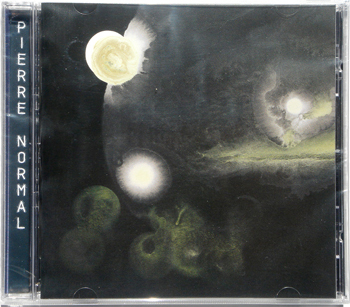 Pierre Normal serves you dark and atmospheric electronica, elektro-wave and electronic chansons. This Belgium / French band is one the best new music projects to emerge since a long time. Highly recommended to all lovers of quality electronic music." your debut is an excellent micro-cosmos of its own - a new electropoetic reality. it’s a shame it’s not vinyl. nocturnal visions unfold. do revolutionize with sighs.